← How to shrink the file size of a PDF for emailing? 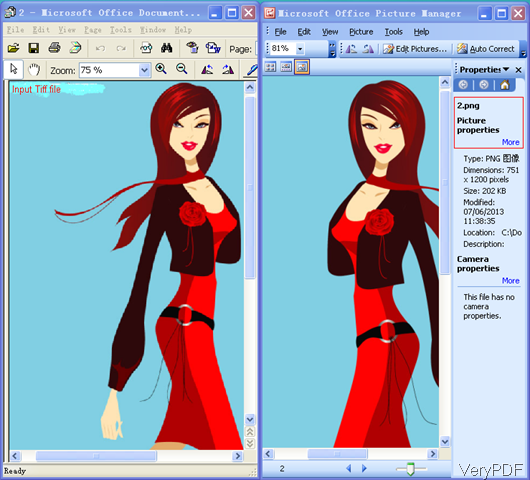 In this article, VeryPDF will introduce one method about change tiff file format to png and add mirror effect by command line. And this method also can be used to change other image file formats like JPEG, PNG, BMP, GIF, PCX, TGA, PBM, PNM, PPM files. Meanwhile during the conversion, you can also resize image width and height. As this is command line version software, you can also call it together with other applications like C#, VB, VC and others. In the following part, I will show you how to make it work. OCR to Any Converter Command Line can be used to convert scanned PDF, TIFF and Image files (JPEG, JPG, PNG, BMP, GIF, PCX, TGA, PBM, PNM, PPM) to editable Word and other editable file formats. Meanwhile this software also can help you change image file formats from one to another. If you need to know more about this software, please visit its homepage. Once downloading finishes, there will be an zip file. Please extract it to some folder then you can call the executable file in MS Dos Windows. What is mirror image effect? A mirror image is a reflected duplication of an object that appears identical but reversed. As an optical effect it results from reflection off of substances such as a mirror or water. It is also a concept in geometry and can be used as a conceptualization process for 3-D structures(quoted from wiki). When you run the conversion, please refer to the usage and examples. When you change image file formats and add mirror effect, please refer to the following command line templates. By this command line, we can deskew and despeckle input image tiff file and then convert it to png and add mirror effect. Please check the conversion effect from the following snapshot. And here are more examples for your reference. If you need to know more parameters and examples, please check them in readme.txt. During the using, if you have any question, please contact us as soon as possible. How to convert tiff to png and specify output width and height? This entry was posted in OCR Products and tagged command line, tiff to png. Bookmark the permalink.